... and the winner is Leduc County! Thank you to Edmonton City Councillor Mike Nikel for his support of this event, and to Krysta Shields (Blackjacks Roadhouse) for dreaming up this campaign. 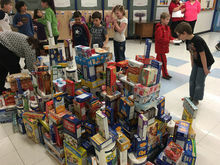 Thank you to the groups and businesses for their creativity and generosity. "You really do make a difference!" start planning their designs for next year! Thank you to everyone who helped to make this event a great success! 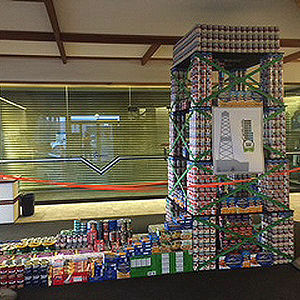 Businesses, schools and other organizations are challenged to start planning for next year and building a structure out of cans of food at your place of business. 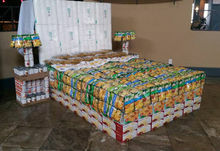 The food will be used to stock the shelves of the Leduc & District Food Bank. 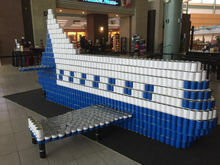 Photos of your Can Art will be then put on display online for the Fan Favorite award and Volunteer Judges will come around to see your creation. Their vote, along with fan favorite, will determine the 2017 CanBuildit Champion. The CanBuildit Gala will have all participating organization’s creations displayed on a slide show and the Champion will be announced. 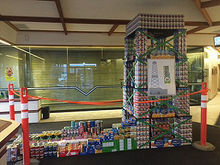 All CanBuildit Can Art will then be disassembled and the food is then donated and picked up by the Food Bank volunteers. All structures should be engineered and built to safely be displayed in a prominent area of the participating organization for all to see.